POF MP5 black stock set. 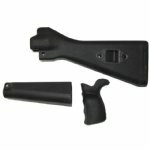 Includes buttstock, grip and handguard. Three brand new parts. Made on HK tooling to exact HK specifications in an HK licensed MP5 production facility. Will fit on all HK94, MP5 or MP5 Clones. Grip will fit on all HK steel grip frames.